There are several reasons why demolishing a building might be necessary or desirable. For example, older buildings can become structurally unstable over time, and the costs of repairing the defects can be higher than simply starting from scratch, making cheap demolition in Melbourne the more affordable option. In these situations, the experts at Ultra Bin Hire & Demolition can provide professional demolition in Melbourne. WHY CHOOSE OUR DEMOLISHERS FOR YOUR PROJECT? We boast a team of highly trained and experienced demolition contractors in Melbourne who can be trusted to get the job done properly. We have access to the latest equipment and employ the most effective methods to safely demolish buildings. Whether you require residential demolition in Melbourne or commercial demolition in Melbourne, we have you covered. Because we know that time is money, our demolishers in Melbourne work hard to get the job done as quickly as possible without compromising quality and workmanship. It can be difficult to know which demolition services in Melbourne your project requires, but one of our experienced and knowledgeable demolition contractors will gladly help you choose the right type of service you need, whether you’re looking for domestic demolition in Melbourne or commercial demolition. Excavation – Our excavation services are perfect for getting your site ready for construction. Whether you need assistance with levelling a slope or need help digging a basement, we can help you get the job done. Asbestos Removal– Need help removing asbestos? We offer safe and professional asbestos removal for residential and commercial properties using the latest techniques and equipment. Rubbish Removal and Bin Hire – If you’re in need of hard rubbish services or cheap skip hire in Melbourne, we offer various options to help you remove rubbish from your property. Site Clean ups– We can boost the safety of your worksite with our comprehensive site clean-up services. 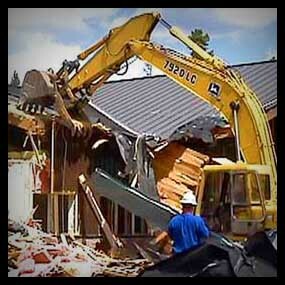 This service is especially useful when used in conjunction with our demolition services in Melbourne. Ultra Bin Hire & Demolition is proud to be a leading provider of high-quality yet cheap demolition in Melbourne. Contact us today by or click on the quote button below to request a free quote.